Trinity Threaders, an artisan fabric arts group, of Trinity Episcopal Cathedral, 315 Goldsborough Street, Easton, is offering unique handmade gifts for sale at its annual Christmas Table. On December 2nd and December 9th, beginning at 11:30 a.m. in Miller Hall, located at 314 North Street behind the Cathedral, this event is open to all. 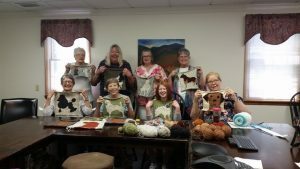 Talented fabric artists have created a variety of handmade items including pot holders, hand knitted sweaters, hats, lap robes, and shopping bags as well as one-of-a-kind Christmas stockings byJan Bohn. In addition to these gifts, raffle tickets for a doggie-themed afghan featuring twelve panels, including dogs of ten different breeds as well as their paw prints and bones. A must-have for any dog lover! The drawing for the afghan will be held on April 7. 2019. For further information, contact the Cathedral office at 410-822-1931.